How many times have fishermen hurled out their final cast while proclaiming: "This is my last Cast", and actually caught a Musky? On a July evening, that is exactly what happened to 20 year old Mike Markowicz of Eau Claire as he fished the Chippewa Flowage…and a Musky that was nearly 40 pounds. Mike’s great catch followed a major cold front that had pushed into the north country six days earlier. Although the fishing had been slow all week, two warm evenings and southerly winds on the preceding two days got the muskies moving. Mike and his younger brother Nick (pictured), who were guests at Indian Trail Resort, had gone out about 5:30 in the evening. Although the temperatures were still a bit cool for July, at 66 degrees it was a very pleasant to be out on the water fishing. The barometric pressure was on the rise and there was a moderate south wind blowing. Having seen several big fish in the Flowage already that season, the two anglers had no shortage of spots that they wanted to try. Hick had a 34 incher follow his ZZ Topper early in the evening. They fished several more spots, but didn’t raise a thing. By sundown, they actually thought of going in early because they had both worked hard that day and were rather tired. "We might as well go in…nothing is going to happen," Mike said. However, because it was ‘Prime Time’, they figured they’d better hit a couple more spots before heading in. After agreeing on which two spots they would make their last, Mike and Nick were forced to alter their game plan because another boat was working one of the places they wanted to hit…a spot where they had previously seen a good 30 pounder. After choosing a somewhat obscure spot on the Flowage as their last stop, their angling fate was solidified. Dusk had enveloped the area, and a weather front that had been sneaking in from the southwest, made for perfect conditions. After working the weed bar thoroughly, Mike and Nick were just about to pack it in. Having each thrown about 15 casts into one particular corner that had looked so promising, Mike fired one final cast into the spot using a custom made Flaptail made by Joel Wick. This was my last cast," he announced to his brother. After reeling in only a few cranks, something quietly slurped at his lure the way a smallmouth bass would hit a bait. Mike felt some weight, set the hook, and could barely move the fish. Although they knew they were into a good fish, the true size of this musky remained a mystery as the fish dogged down and back and forth beneath the surface. The musky did a lot of digging near the back of the boat and mike couldn’t do much with the fish except keep tension on it. Mike couldn’t get over the sheer power that the musky displayed with her headshakes and runs. He played it for quite a while, maybe five minutes, until getting it near the boat and in view. The first time the fish came up, it went underneath the boat and Mike brought it back out, telling Nick, "Scoop the fish up as soon as it’s ready." Nick was at the ready with the net; however, the next two times Mike brought the musky to the boat, the fish was facing away and wasn’t ready to be netter. Excited but clearly focused and up to the task at hand, both boys saw the musky was a big one—well over 30 pounds, they thought. Once Mike brought the fish back around and alongside the boat, Nick—with a small flashlight in his mouth---proceeded to scoop up into the net what turned out to be a 40-pound-class musky. Although the fish didn’t do anything explosive or wild during the fight, once it got into the net, it went crazy, dislodging the lure and nearly tearing the net out of Nick’s hands. Because Mike intended on releasing this huge fish, Nick let the net and the fish in the water. Although he is strong, Mike struggled as he hoisted the lunker up out of the net. Upon taking a quick measurement, the boys figured it to be a good 51 inches in length. Figuring it to be perhaps 35 pounds, they had no idea they had just caught a 40 pounder. Mike put the musky back into the water to let it go, but it went belly up and wouldn’t revive. They worked on the fish for a while, but quickly reasoned that the musky was just too exhausted to survive being released. So they hauled it back into the boat, subdued the fish with a pair of pliers, and came into the dock at Indian Trail Resort. The musky weighed in officially at 39 pounds 11 ounces, measured 52 ½ inches long, and had a 23 ½ inch girth. 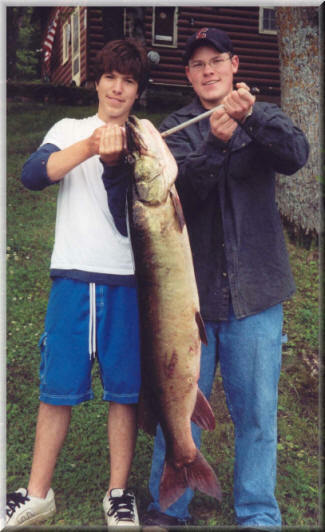 In 50 years of record keeping at Indian Trail Resort, Markowicz’s musky is the third heaviest ever caught. Although they are young, Mike and his brother are quite experienced as musky fishermen, having both previously caught muskies in the 25-pound class. Catching his first musky when he was only about eight years old, Mike has since put more than 40 muskies into the boat.